Women in Finance discussing the Challenges of being a woman in the male dominated work environment. 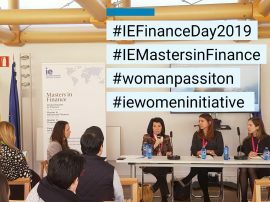 Women in Finance Panel: “Women in Finance – Breaking Barriers” is a professional panel that brings female professionals working in different areas of finance to the IE campus during the IE Finance Day to share their personal and professional experiences as women in finance. We invited 3 outstanding women (Monica Valladares, CFA, FRM, General Counsel of the CaixaBank Asset Management Company, Susana Martinez Meyers, Associate Professor of IE University, and Almudena Rumeu de Armas, Portfolio Manager at Varianza Gestión SGIIC, S.A) who have achieved success through differing career paths to talk about their journey and accomplishments. The panel aims to uncover the numerous challenges that women have to face working in the finance industry that is dominated by men. The speakers also gave valuable advices for women who are working in the finance sector or who wish to start a career in finance. The topics discussed were prevalent topics affecting women in this industry. The event was an initiative by the IE Finance Team in an effort to help women in finance grow in the corporate ladder. 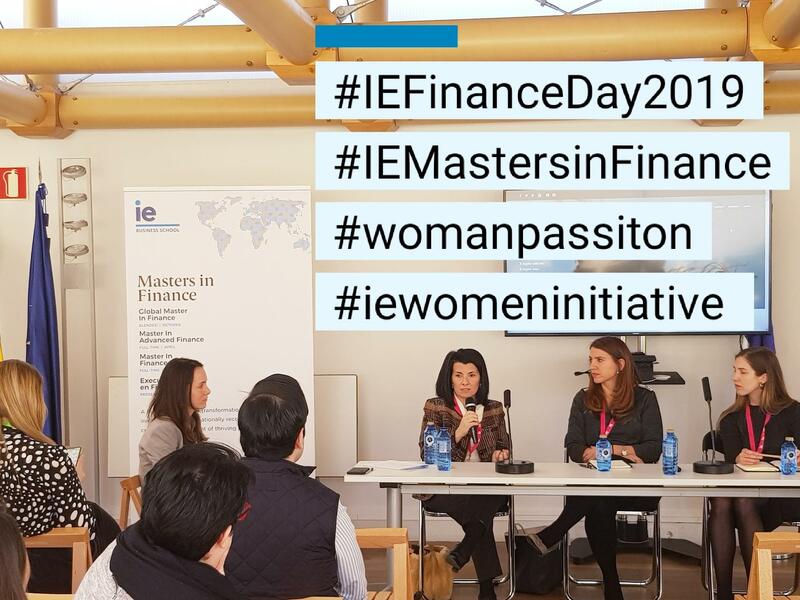 IE Business School as an institution has recently launched the IE Women Initiative to encourage women talents in different areas including Women in Finance, attracting women to study a Master in Finance with us. According to IMF, women accounted for less than 2 percent of financial institutions’ chief executive officers and less than 20 percent of executive board members. The proportion of women on the boards of banking-supervision agencies was also low—just 17 percent on average in 2015. IE wishes to be part of those who want to make changes happen. Viet Ha Tran, Director of Admissions for Masters in Finance, IE Business School, Alumnus of IE Master in Marketing Management 2009. For the past 10 years, Ms. Tran is the Head of Admissions for the Finance Master Programs at IE Business School. She leads an international team of exceptional professionals who specialize in recruiting the best Finance talents to IE. Originally from Vietnam, she holds a Bachelor of Business Administration from Ritsumeikan University (Japan) and a Master in Marketing Management from IE Business School. Before joining IE in Madrid, Ms. Tran worked for Japan Parker Group, Euromonitor International, and Mizuho Bank in Tokyo, Singapore and Hanoi respectively. Her fields of expertise include market intelligence, investment feasibility studies, trade finance, credit risk management, real estate consulting, government relations, and talent acquisition in the education sector. In 2017, combining her passion for art and education, Viet Ha co-founded I FEMME which is an art project aiming at raising funds in order to send girls who have no access to education to schools. Viet Ha believes that education is the most powerful weapon which we can use to change the world and art is another way to change the perspective and inner vision of a person. She hopes that I FEMME will help changing lives of thousands of girls.